S Sahu, S Burathoki, M Husain, D Bahl, P Sachan. 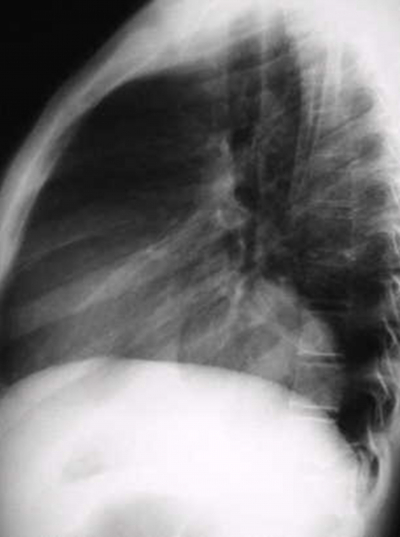 Mediastinal Pseudocyst: A Rare Site Of Presentation. The Internet Journal of Surgery. 2007 Volume 14 Number 2. 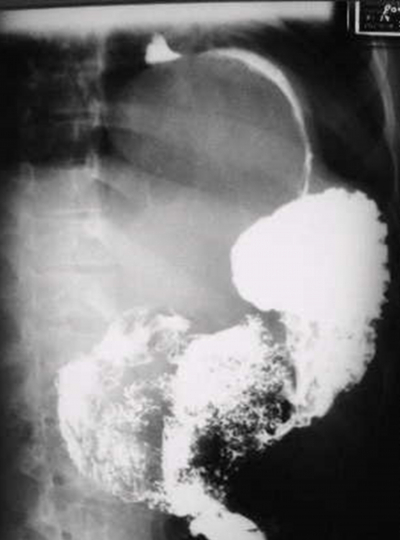 A common complication of inflammatory, traumatic and neoplastic conditions of the pancreas is pseudocyst formation, with a cavity lined by granulation or fibrous tissue without an epithelial lining, containing pancreatic enzymes and located in the peripancreatic areas in the abdomen. Mediastinal pseudocysts are postulated to be caused by rupture of the pancreatic duct posteriorly into the retroperitoneal space with tracking down of pancreatic enzyme-rich fluids into the mediastinum through the diaphragm. Patients may present with dysphagia, odynophagia, dyspnoea, pseudoachalasia, heartburn, back pain, weight loss, chest pain and congestive cardiac failure. Contrast-enhanced computed tomography has a very high sensitivity in providing the location and anatomical relation of the pseudocyst to the surrounding structures. Drainage may be in the form of laparotomy, radiologically guided external drainage or endoscopically guided internal drainage. We report for the first time a rare case of mediastinal pseudocyst with an associated Barrett's ulcer. A 14-year-old female presented with a chief complaint of progressive dysphagia since the last one and a half year which was more serious to solids than to liquids. She also complained of on-and-off odynophagia and retrosternal burning sensations during this period. She gave a past history of suffering from severe pain in the upper abdomen and jaundice 2 years back for which she had consulted a local physician and got treated; the records were not available. On admission, her vital parameters were within normal limits. Systemic examination revealed no abnormality. Routine investigation revealed: hemoglobin 13g/dl, total leukocyte count 7240, differential leukocyte count: neutrophils 56%, lymphocytes 42%, and eosinophils 2%. Random blood sugar was 431mg/dl. Renal and liver function tests were within normal limits. Figure 1: Upper Gastrointestinal Endoscopy Revealing Ulceration At The Lower End Of The Esophagus Just Proximal To The Gastro-Esophageal Junction And An External Compression To The Esophagus At The Lower End. Histopathological study of the ulcer suggested Barrett's ulcer. 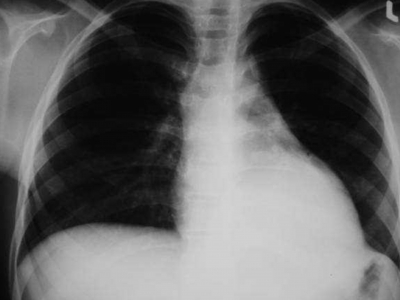 Figure 2: Chest X-Ray In Antero-Posterior View Showing A Rounded, Dense, Radio-Opaque Retrocardiac Shadow. 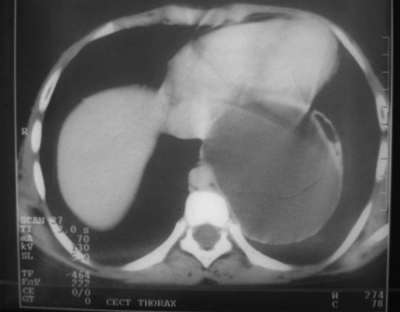 Figure 3: Chest Radiology In Left Lateral View Showing A Rounded, Dense, Radio-Opaque Retrocardiac Shadow Localized In The Posterior Mediastinum. Figure 5: Contrast-Enhanced Computed Tomography Of The Thorax Showing A Thin-Walled Cystic Lesion In The Posterior Mediastinum Compressing The Heart Anteriorly And The Lower Esophagus Anterolaterally Towards The Left. Figure 6: Contrast-Enhanced Computed Tomography Of The Upper Abdomen Showing A Thin-Walled Cystic Lesion Compressing The Stomach Anteriorly. Analysis of the fluid aspirated from the cyst under CT guidance showed an amylase of 4480 IU/l. Postoperatively, the intercostal chest tube drainage fluid was sent for analysis of the amylase value, which was found to be within normal limits. The patient had an uneventful postoperative recovery. 1. Shantanu Kumar Sahu, Shailendra Raghuvanshi, Sanjay Agarwal, Dig Vijai Bahl, Praveendra Kumar Sachan: Gastric Outlet Obstruction Due To Pancreatic Pseudocyst. The Internet Journal of Surgery 2007. Volume 12, Number 1. 2. Fulcher AS, Capps GW, Turner MA. 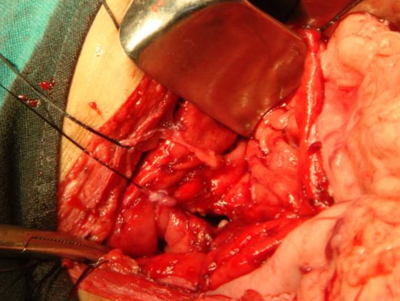 Thoracopancreatic fistula: clinical and imaging findings. J Comput Assist Tomogr 1999; 23:181-7. 3. Ruchi Gupta, Juan C, Munoz, Praveen Garg, Ghania Masri, Norris S. Nahman, Jr, Louis R. Lambiase. 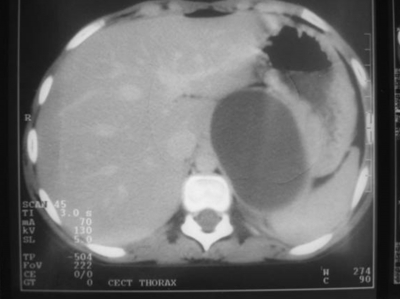 Mediastinal Pancreatic Pseudocyst - A Case Report and Review of the Literature. Medscape General Medicine 2007; 9:8. 4. Johnson RH Jr, Owensby LC, Vargas GM, Garcia-Rinaldi R. Pancreatic pseudocyst of the mediastinum. Ann Thorac Surg 1986; 41:210-12. 5. Mallavarapu R, Habib TH, Elton E, Goldberg MJ: Resolution of mediastinal pancreatic pseudocysts with transpapillary stent placement. Gastrointest Endosc 2001, 53:367-370. 6. Komtong S, Chanatrirattanapan R, Kongkam P, et al. Mediastinal pseudocyst with pericardial effusion and dysphagia treated with endoscopic drainage. JOP 2006; 7:405-410. 7. Chettupuzha AP, Harikumar R, Kumar SK. Pancreatic pseudocyst presenting as odynophagia. Indian J Gastroenterol 2004; 23:27-28. 8. Panackel C, Korah AT, Krishnadas D, Vinayakumar KR. Pancreatic pseudocyst presenting as dysphagia: A case report. Saudi J Gastroenterol 2008; 14:28-30. 9. 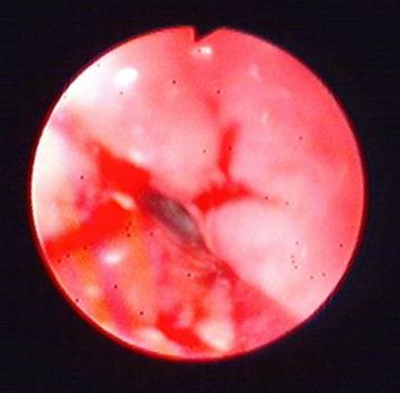 Obuszko Z, Beggs D. Dysphagia due to a pancreatic pseudocyst with mediastinal extension. Eur J Cardiothorac Surg 1998;13:316-318. 10. Umar Sadat, Asif Jah, Emmanuel Huguet. Mediastinal extension of a complicated pancreatic pseudocyst; a case report and literature review. J Med Case Reports 2007; 1:12. 11. Jeung MY, Gasser B, Gangi A, Bogorin A, Charneau D, Wihlm JM, et al. Imaging of cystic masses of the mediastinum. Radiographics 2002; 22:S79-93. 12. Grace PA, Williamson RC. Modern management of pancreatic pseudocysts. Br J Surg 1993; 80:573-81. 13. Geier A, Lammert F, Gartung C, Nguyen HN, Wildberger JE, Matern S. Magnetic resonance imaging and magnetic resonance cholangiopancreaticography for diagnosis and pre-interventional evaluation of a fluid thoracic mass. Eur J Gastroenterol Hepatol 2003; 15:429-31. 14. Ingram M, Arregui ME. Endoscopic ultrasonography. Surg Clin North Am. 2004; 84:1035-1059. 15. SG Kirchner, RM Heller and CW Smith. Pancreatic pseudocyst of the mediastinum. Radiology 1977; 123:37-42. 16. Lee FY, Wang YT, Poh SC. Congestive cardiac failure due to pancreatic pseudocyst. Cleve Clin J Med 1994; 61:141-143. 17. Bardia A, Stoikes N, Wilkinson NW. Mediastinal pancreatic pseudocyst with acute airway obstruction. J Gastrointest Surg 2006; 10:146-150. 18. Tan MH, Kirk G, Archibold P, Kennedy P, Regn MC. Cardiac compromise due to pancreatic mediastinal pseudocyst. Eur J Gastroenterol Hepatol 2002; 14:1279-1282. 19. Yasuda H, Yoshifumi I, Hisato H, et al. A case of pancreatic pleural effusion and mediastinal pancreatic pseudocyst: Management by a somatostatin analogue octreotide. Pancreas 1999; 19:410-412. 20. Kim D, Chung H, Gham G. A case of complete resolution of mediastinal pseudocyst and pleural effusion by endoscopic stenting of pancreatic duct. Yonsei Med J.2003; 44:727-731. 21. Saftoiu A, Ciurea T, Dumitrescu D, Stoica Z. Endoscopic ultrasound-guided transesophageal drainage of a mediastinal pancreatic pseudocyst. Endoscopy 2006; 38:538-539. 22. Kotsis L, Agocs L, Kostic S. Transdiaphragmatic cyst-jejunostomy with Roux-en-Y loop for an exclusively mediastinal pancreatic pseudocyst. Scand J Thorac Cardiovasc Surg 1996; 30:181-183.